My father passed on to me many wonderful things: a strong work ethic, a sense of humor, dimples, to name a few. He also passed on to me the genetics for type 2 diabetes. Thanks Dad. A shrewd card player, my dad would say, “A card laid is a card played.” But is that the case in life's game of type 2 diabetes risk? You may get dealt the hand that includes the type 2 diabetes gene. How you play that hand with lifestyle choices can determine whether or not, and how soon in life, it plays itself out. Type 2 diabetes is the most common form of diabetes that impacts millions of people worldwide. It is a disease that can affect a person's quality of life. With type 2 diabetes, the body does not produce enough insulin from the pancreas and/or there is insulin resistance. This resistance occurs because the mechanism that allows insulin into the body's cells is broken. Insulin is vital to our body. Without it, we cannot live because it is the carrier that transports the sugar and starch from food into the body cells for fuel. When diabetes is uncontrolled, the glucose (sugar) builds up in the blood. The body does not like high blood glucose, and a cascade of reactions occur when the body tries to compensate. This can lead to health complications, including poor blood circulation, vision impairment and fatigue. It is also important to know that high blood pressure, low HDL cholesterol (the good type of cholesterol) and high triglycerides (blood fats) are also factors associated with increased risk of type 2 diabetes. Strong evidence exists to support the positive impact of healthy lifestyle to prevent or delay the progression of type 2 diabetes. The Diabetes Prevention Program was a large study that included overweight people who were at risk for developing type 2 diabetes (2). The study showed that losing weight and becoming more physically active decreased the risk of getting diabetes by 58%. Most people in the study chose to walk 30 minutes a day, five days per week. 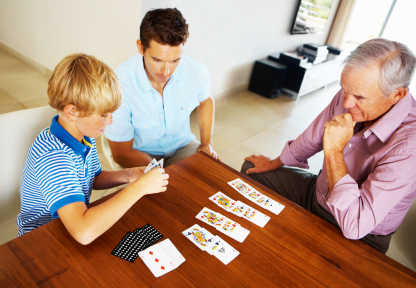 So, a card laid may not be a card played if you are dealt the type 2 diabetes gene. To a large extent, you can determine how you play your hand. The trick to winning the game is being physically active and achieving a healthy body weight.